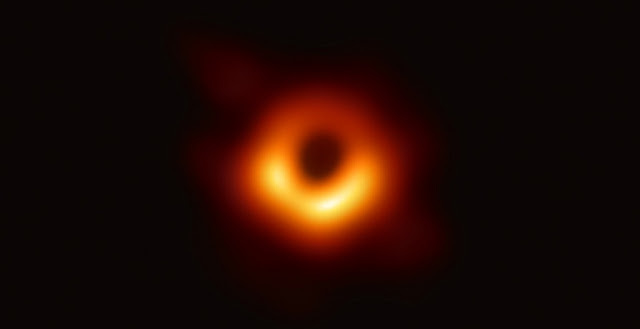 The Event Horizon Telescope (EHT) — a planet-scale array of eight ground-based radio telescopes forged through international collaboration — was designed to capture images of a black hole. On Wednesday, in coordinated press conferences across the globe, EHT researchers revealed that they have succeeded, unveiling the first direct visual evidence of a supermassive black hole and its shadow. "The confrontation of theory with observations is always a dramatic moment for a theorist. It was a relief and a source of pride to realize that the observations matched our predictions so well," elaborated EHT Board member Luciano Rezzolla of Goethe Universität, Germany. The EHT observations use a technique called very-long-baseline interferometry (VLBI) which synchronizes telescope facilities around the world and exploits the rotation of our planet to form one huge, Earth-size telescope observing at a wavelength of 1.3mm. VLBI allows the EHT to achieve an angular resolution of 20 micro-arcseconds — enough to read a newspaper in New York from a café in Paris. European facilities and funding played a crucial role in this worldwide effort, with the participation of advanced European telescopes and the support from the European Research Council — particularly a €14 million grant for the BlackHoleCam project. Support from ESO, IRAM and the Max Planck Society was also key. "This result builds on decades of European expertise in millimeter astronomy”, commented Karl Schuster, Director of IRAM and member of the EHT Board.